In John 10:10 Jesus said, “I have come that you might have life and that you might have it more abundantly!” This type of abundant life is something I call “Level 10” living. On October 10th, 2010, I was reading John 10:10—there it was—a divine synergy! I saw “Level 10 Living“. Jesus said something vital: “I have come that you might have life and have it more abundantly.” I believe an abundant life comes down to simple principles that are challenging to live. Remember in the Bible where it describes Daniel, Shadrach, Meshach and Abednego as ten times brighter than the other youth who were interviewed by Nebuchadnezzar to serve in Babylon? Let me ask you a question, would you be willing to take your daily state, put it in a bottle, and give it to your best friend as a birthday present? Until your are living in a place where you have peace, hope, love, a sense of passion and engagement in something meaningful, in your destiny, you’ll never have the state you would want to give. An abundant life isn’t necessarily about abundant resources. You can have abundant life on your way to making money! Who wants to be miserable and only be happy when they’ve got money?! Abundant life isn’t being happy because you have a the perfect spouse. What about being single and happy until God brings the person for you? 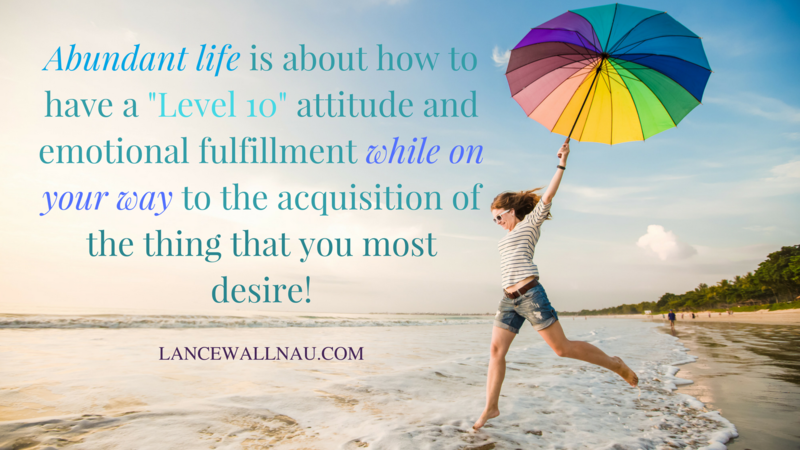 “Level 10 Living” is about how to have an abundant life on the way to the acquisition of the thing you desire! What if I could give you some of those simple principles in such a way that they clarify for you what you really have to do in order to live at a level 10 quality? I’m going to train you on what you need to know to make this a reality. After seven years of study, I finally have the essence of these principles compiled into a single teaching. It’s called “Level 10 Secrets.” I’m even going to give you the first two modules for free! Question: Would you be willing to take your current daily state—where you are now on your way to what you dream of—and bottle it and give it to your best friend for a day as a birthday present? Why? Why not? If they wanted to go after the extreme and the unexpected. Sure. If they wanted life to be the same and be safe, then probably no. If someone said to me, “Todd I’m absolutely terrified of what would happen if I did this, or so….”, then my current state would encourage and strength them. For instance I keep having this ridiculous saying come to me regarding the current way that I believe relationships, especially marriage, has been handled wrongly. To me, it has done more damage than good. “We have the five love languages. The problem is that she ain’t talking ’bout love, Jr!! !” ☺?? Yeah, I think that marketplace ministry is definitely for me. So how do I get the first two modules? Very interesting topic and confirming as well! My husband just last weekend kept receiving in The Spirit a STRONG witness about the number 10 within the plenary of scripture and its relevance to us now. Your John 10:10 scripture revelation was riveting. Also Thank you for being a good example…as a Christian American man… who tries to serve The Lord in a spirit of excellence. Your video stream on this Level 10 topic shows how appropriately you dress yourself, with a professionalism that bespeaks the aspiring American man. My husband is an Executive at a large Corp. and he choses to do the same when others do not in todays marketplace setting. Further – your example is one that many SHOULD follow – within Christian leadership and the local church house. Too many preachers, pastors, and teachers in leadership roles today, dress as if they just stepped out of a “garage band group!” That’s not a good enough example. It’s TIME for Christian American men to SHINE again. I have been following you for a while. I am so excited to know you are so kind to let us get the two modules free. I purchased the Level 10 Secrets training and the video for Lesson 10: Strategy For Pre-Eminence is exactly the same as the video for Lesson 9: Your Principals. Kindly upload the correct teaching video for Lesson 10: Strategy For Pre-Eminence. JUDGMENT IS COME UPON THE SERPENT IN THE HOUSE OF ISRAEL !!! I AM COME TO DELIVER MY PEOPLE ISRAEL FROM THE HAND OF THE SERPENT !!! THE CHORUS OF THE REMNANT OF GOD !!! YOU WILL BE EXALTED IN THE NEW KINGDOM OF GOD ON EARTH !!! I AM COME TO DELIVER AMERICA FROM THE HAND OF THE SERPENT !!! DONALD J. TRUMP WILL BE THE NEW PRESIDENT OF THE NEW UNITED STATES OF AMERICA !!! YOU LANCE WILL BE EXALTED TO LEADERSHIP IN THIS NEW KINGDOM OF GOD ON EARTH.